The most famous Pierce Butler was a founding father and US Senator from South Carolina. 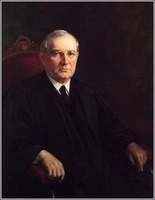 An apparently unrelated Pierce Butler was the first Supreme Court justice from the state of Minnesota, after earning his chops as a lawyer for the James J. Hill interests (Jame McClure writes about him on the web at Saint Paul Historical). It is this second Pierce Butler (one of many) for whom the Pierce Butler route (map) in St. Paul is named. The Pierce Butler route runs south of the east-west railroad mainline through St. Paul, complementing Energy Park Drive to the north. It progresses from Transfer Road, home of the classic mid-late twentieth century future-to-be-restored Midway Amtrak station that served Twin Citizens for decades, below Snelling Avenue, terminating at Minnehaha Avenue just shy of Dale Street. There is a dream (I dare not call it a plan, since it doesn’t rise to that level of officialness) to extend it westward to connect with Granary Road in Minneapolis through the St. Anthony neighborhood. The concept is to run it along the Railroad tracks, on Capp Road, connect to or parallel Robbins Street through the Community Gardens on the north side of Robbins Street, under Mn 280 to Granary Road. On first blush from a transportation perspective, this seems a logical route. It doesn’t take any houses, it increases connectivity so traffic can be more dispersed, and gets “wandering” trucks off of more obviously residential streets. The St. Anthony Park neighborhood opposes this. People garden in the local community gardens (though surely these gardens could be re-sited). Local politicians have said “Pierce Butler Route will not be extended into St. Anthony Park.” If politicians were perfect forecasters or highly powerful or unflinchingly ethically who were in office forever, we might take them at their word, however as community groups have long realized, fighting a line on a map is a forever war. Once it is built it is not easily unbuilt. But while still unbuilt, that is a more easily reversed decision. The term “induced demand” could more appropriately replaced with latent demand. Otherwise the secret to economic development in stagnant areas such as Minnesota’s Iron Range and the high plains of Montana would be to just widen the roads.